This past week I was able to go to the FPEA convention in Orlando with a friend of mine. We had such a great time. This is my thrid year going to the convention, and I confess, I spend all day in the exhibit hall. The lectures and encouragment are great, and if I could afford to stay over for a night, I would definitely attend those, but as it is, I have to do a day-trip and the exhibit hall takes all my time. My friend and I do plan to order audio recordings of some of the lectures for us to listen to at home. Being in the exhibit hall is such a great experience. First, you really get a picture of just how big homeschooling is. Sometimes I feel like I am on a very small island as a homeschooling mom, just because you don’t see a TON of people like you around. But, at the convention, my friend and I were talking about how many people were there, and just how different they all are. Homeschooling really does represent people from all walks of life! We are lucky that our convention is pretty big, with lots of vendors, both well-known and not-so-well known). This year Heart of Dakota was even there! I’ve been wanting to see them in person for a long time, and this is the first time they’ve come to Orlando so that was exciting. The FPEA also hosts a yearly homeschool graduation ceremony for seniors during the convention which is really cool. We got to see all these kids (many of whom have grown up homeschooling), and it’s just reassuring to relatively new homeschoolers like us that there are so many people who complete this journey successfully! It’s also cool that they make it so fun for the kids. The seniors have events going on all weekend, culminating in the graduation ceremony the whole family can attend! It was also nice to get away for a day and spend some time just hanging out and talking with my friend. I love to be with my kids, but every once and a while, it’s refreshing to spend some time with another mom just sharing your thoughts, ideas, and frustrations. It’s nice to be around someone else who can understand what it’s like to be in your position. In short, it was a great trip, and I am looking forward to next year. Aaahhh! We are entering our final two weeks of this “official” school year and it’s like my boys and I can see the light at the end of the tunnel! We’ve had a lot of fun, but I think we are all ready for a well-deserved break! For the most part, we follow the calendar of our local schools, with a few extra breaks built in. We will finish up school about a week after everyone else. I do this mainly because my boys have a lot of friends who go to regular school, and we spend a lot of time in the summer hanging out with them and their parents, so it’s easier if our schedule mimics theirs. Now that I’ve completed my first full year of homeschooling, I’m realizing I’ve learned a few things. First of all: know when to let go! I made a lot of great curriculum choices this year, but I also made some not-so-great ones too. At first, it was hard for me to admit that something wasn’t working, especially if I really wanted it too! However, one of the key freedoms of homeschooling is FLEXIBILITY! When something doesn’t work, you can change it. So we scrapped our initial history plan and went with just the Time Traveler’s CD’s and library books and it went great! I realized that part of the problem was *me*. I had this idea in my head about how things were supposed to go, and because I didn’t want to let go of it, we were all miserable. Lesson learned, sometimes you just have to step away from your original idea and make a new plan! I’ve also learned that I need to not let the little things get to me so much. This is hard, because having been a classroom teacher for so long, I am all about a schedule!! However, as we all know :), life doesn’t always go on schedule, and there are days when the “schedule” has to be scrapped altogether. I realize now, that even with these unplanned interruptions, my kids are still getting way more school than they did in a regular classroom, due to the fact that we really don’t have “sick” days, we just do the work another time. So, if you have your year all mapped out, and you get a monkey wrench thrown into things, don’t sweat it, it’s really not as big a deal as you think. I think the most important thing I’ve learned this year is that I CAN do this and do it well. I was nervous about the idea of teaching my own kids full-time, I mean, that’s a LOT of responsibility. It’s different from being in a classroom. I was part of a team of teachers and together we were all responsible for the education of our students. At home, it’s just me! But then again, it really isn’t. God led our family to homeschool, and I have learned throughout this year, that if I just trust in Him to lead us, He really will provide for all the big (and small!) things we need. That knowledge in itself is a HUGE relief for me! I am going to enjoy a vacation with my family this summer, and after taking a little “mental” break from school myself, I will plunge back into planning for next year (I am a planner by nature 😉 ). I am a little stressed because it is the end of May and we have NO curriculum for next year yet!! But I have to wait for a couple more paychecks before we get it, which is bad in a way, because it gives me tons of time to think, and then rethink, my choices!! Choosing curriculm is by far the most difficult part of homeschooling for me, but that’s a whole different post! 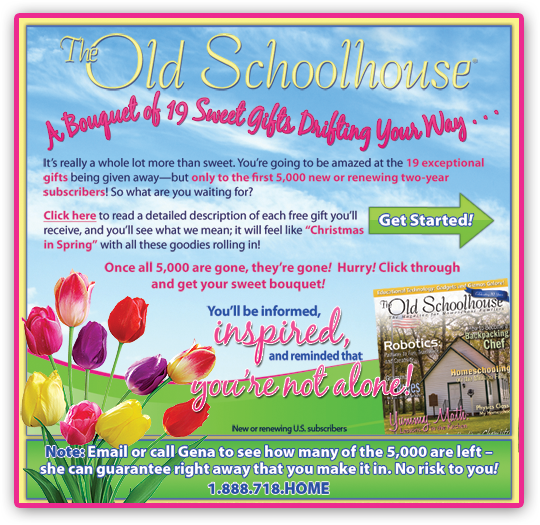 Believe it or not, The Old Schoolhouse Magazine is 10 years old. In their recent issue, Gena wrote a column about how far they have come, and it’s pretty impressive. I have only been homeschooling for a little over a year, but I can tell you that TOS has been an indespensible source of inspiration and encouragement to me. From their magazine, to their Teacher’s Toolbox, to the homeschool blogger and all the freebies they frequently offer, I know I can always turn to TOS for help when I need it. This year, I was fortunate enough to be a part of the TOS crew. Through this experience, I got to try out soooo many amazing programs. I also got to interact with other members of the crew, many of whom have MUCH more experience as homeschool moms than I do. 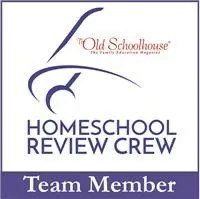 For a homeschooling newbie like me, their knowledge and encouragement was invaluable! I also learned a lot of tech stuff as well! I am very thankful for this experience, and all that TOS has given me this year! How would you like to have literally hundreds of classic books to use for school (or fun) with your children at your fingertips? With Yesterday’s Classics, you can!! I, unfortunately, do not own a Kindle or EReader device at the moment. However, I simply downloaded the free kindle/ereader software available online and viola!, instant access to the books. Information about this available software is included, as is a list of books arranged by level (i.e. ages 5-7), genre, title and author. Once I got comfortable with the software, I found it easy to navigate the vast numbers of books, and each book has a table of contents, making it easy to find your place as you are reading. Some of the genres include: science, world history, American History, fables, poetry, Christmas stories, Ancient Rome, and the list just goes on and on! Illustrations are included in the books, and you can download them onto as many devices as you want. I actually downloaded the Kindle version onto one computer, and the EReader version onto another. Now, the files did take a WHILE to download, and we have a pretty fast internet connection, but once I was done, that was it! Did I mention that Yesterday’s Classics also includes email support in case you have any trouble with your downloads? They are very helpful, quick and responsive. New titles are also published regularly. They even have a free sample book available on the website (The Dutch Twins) so you can check it out if you want before you get it! This is ABSOLUTELY something I would recommend to any homeschooler looking for quality classic children’s literature! **NOTE: I received this program for free for the purpose of writing this review. All opinions expressed are my own.